Write letters and emails to the UN and the Sri Lankan Foreign Minister demanding that they take action against religious hatred in Sri Lanka targeting Muslims and Christians. IHRC are urging campaigners and activists to demand the Sri Lankan government to fulfill its commitment to “promote and protect the human rights[sic] all its citizens” by ensuring that the rights of Sri Lanka’s Muslim and Christians are safeguarded and that groups spreading religious hatred such as Bodu Bala Sena are stopped. On 16 February 2013, the Sri Lankan “Bodu Bala Sena” organisation or “Buddhist Power Force” held a rally in Maharagama inciting religious hatred through references to the Muslim Hijab as ‘gonibilla’ (bogieman) outfits and calling for a total ban on Halal products. 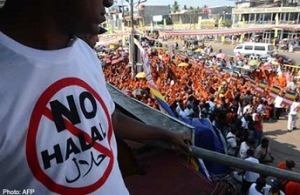 The General Secretary of Bodu Bala Sena, Galaboda Aththe Gnanasara Thero, issued an ultimatum at the mass rally demanding that the government ban Halal certification by 31 March 2013 and promising an anti-Halal campaign until the ban is announced. Anti-Muslim sentiment is becoming increasingly manifest in Sri Lanka with accounts of blockades of Muslim-owned stores, several death threats issued to Muslim shop owners in the Kurunegala District, and threats to demolish the Dambulla mosque in central Sri Lanka. There have also been attacks on Christian clerics, churches and religious articles; a statue of the Virgin Mary was torn down in a provincial town. The Sri Lankan government claims to work towards safeguarding democracy and freedom for all its citizens and maintaining a “policy of openness and cooperation with all international human rights treaty bodies and mechanisms”. If this is the case, then the government must ensure an immediate end to the numerous human rights violations of Muslims and Christians and take appropriate legal actions against all those responsible for the attacks against minority groups. I am deeply concerned over the anti-Muslim and anti-Christian sentiments being spread in Sri Lanka by the Bodu Bala Sena organisation. On 16 February 2013, “Bodu Bala Sena” or “Buddhist Power Force” held a rally in Maharagama inciting religious hatred through references to the Muslim Hijab as ‘gonibilla’ (bogieman) outfits and calling for a total ban on Halal products. The Sri Lankan government claims to work towards safeguarding democracy and freedom for all its citizens and maintaining a “policy of openness and cooperation with all international human rights treaty bodies and mechanisms. This ongoing oppression of individuals which is a clear violation of human rights law must not be tolerated by the UN which claims to stand for justice. I look forward to hearing back from you regarding the actions you will be taking. I am deeply concerned over the anti-Muslim and anti-Christian sentiments being spread in Sri Lanka by the Bodu Bala Sena organization. The Sri Lankan government claims to work towards safeguarding democracy and freedom for all its citizens and maintaining a “policy of openness and cooperation with all international human rights treaty bodies and mechanisms”. If this is the case, then you must ensure an immediate end to the numerous human rights violations of Muslims and Christians and take appropriate legal actions against all those responsible for the attacks against minority groups. I look forward to hearing back from you regarding the action you will be taking.